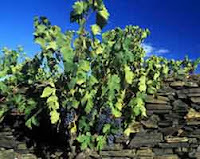 Licorella or brown slate mineral, is the region that surrounds the interior of the Priorat region (Spain). This mineral is the most important wines of the region, as its brittle and also makes them resistant form a concentrated amount of nutrients to crops that characterize the area. Vines and olive trees form the landscape of the Priorat, Costers in beds or as they call the same crops in the foothills of the mountains. It has truly been a pause in time that has passed too quickly, visiting towns like Torroja del Priorat, Gratallops, Porrera, La Vilella Baiz, L'Escaladei and Falset, its people, its wineries, its surroundings streets, tasting the wines and oils, with lovely people and in turn to their traditional roots. In next post I will give you more details and impressions of my trip, and not commenting on the wines I've tasted and I have to try.